How does the use of a secret vote affect the likelihood that legislators will punish their peers? Two contending arguments exist in the literature: some argue that secret voting may be prejudicial, while others argue that it may help accountability. We address this controversy by analyzing the case of the Brazilian Congress, which uses a sequential combination of open and secret voting procedures. We begin with a statistical analysis of the Congress that establishes some key parameters of variance. The results of this exercise are then used to populate an agent-based model of the Congress, which is used to simulate a variety of potential behaviors under diverse conditions. Agent-based modeling enables us to extend the discussion beyond the small-n of cases available in the real world, demonstrating that slight changes in parameters can lead to very large changes in the overall effect of voting procedure. 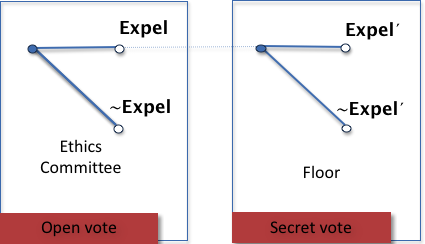 Modeling voting behaviors under different conditions, we conclude that both arguments about secret voting may hold true, and that the effects of the type of vote – open or secret – will be contingent on factors such as the power of the accused politician, the composition of the voting body, and the publicity given to the accusations. How does voting secrecy influence accountability? Do secret voting procedures help or hinder legislative bodies seeking to hold their own members responsible for wrongdoing? This question goes to the heart of the institutional rules that govern political accountability in representative democracies, where members of the legislative body are often asked to judge peers accused of wrongdoing. On the one hand, it may be that secrecy is the enemy of accountability: secret voting might permit accused politicians to make backroom deals, blackmail, or otherwise intimidate their peers so as to guarantee political survival. Secrecy might also enable corrupt peers to deal leniently with the accused legislator, in the hopes of lowering the bar for future efforts at improving probity within the legislative body. A secret vote is less visible to the public, and may thus diminish legislators' fear of public backlash or electoral penalties. In sum, secrecy may enable politicians to skirt efforts to punish their peers, by reducing their fear of retribution from voters or the media. This "sunshine" argument is common in democratic theory: both Bentham and Mill, for example, were early proponents of the salutary effect of openness, whose potential exposure of wrongdoing might force elites to do their duty and in the process strengthen the public legitimacy of certain procedures (Chambers 2004; Naurin 2004). On the other hand, secrecy serves as an antidote to intimidation, permitting legislators to vote sincerely without fear of reprisals from their peers. Even if a legislator is not personally corrupt and is convinced his accused peer is corrupt, he might nonetheless avoid voting to expel his peer, fearing retribution of some sort. So it may be that secrecy serves as a "shield," enabling politicians to challenge powerful legislative leaders or party bosses in ways that would be unthinkable in an open vote. Indeed, a variety of procedures – e.g., juries, trade agreements, constitution writing, admissions committees (Chambers 2004; Elster 2010) – may benefit from "shielding" participants from the public or from particular audiences, such as the injured or losing parties. Secrecy in legislative expulsion votes, however, is mediated by factors such as the publicity given by the media and the relative power of the accused politician. Other things equal, the greater the media exposure, the more certainty publics may have about the charges against a politician, and the more propitious the conditions for expulsion. Acting in the opposite direction is the power of the accused legislator: other things equal, the more powerful the legislator, the less likely his peers will punish him. So publicity and power interact with voting procedure: whether the vote is secret or open determines how easily retaliation can be targeted or how much a vote to acquit can be observed by voters. How do these factors play out in practice? From an empirical perspective, this question has proven extremely difficult to answer, in large part because the number of scandals and votes occurring under comparable conditions is usually limited. In this paper, therefore, we take advantage of an unusually large number of legislative votes taking place in the Brazilian lower house (the Chamber of Deputies) during the 2003–2006 legislative session. This information is used to draw up basic assumptions about how accountability is influenced by a combination of secret and open voting rules. The first section presents a basic model of vote choice, and tests its central implications using empirical data from efforts to enforce accountability in Brazil's lower house. Because there is insufficient data to derive robust conclusions about the "sunshine" or "shield" effects, however, the second section uses the statistical results to establish the basic parameters of a computer simulation, which then is used to explore the basic conditions that make secret or open voting more or less effective in generating accountability, and to derive theoretical implications for the smooth functioning of accountability processes. On March 14, 2006, the Ethics Committee voted publicly, in a 9 to 5 roll-call vote, to recommend the expulsion of former Chamber president João Paulo Cunha. Cunha was accused of having received US$23,000 from a publicity agency caught up in a major scandal that rocked the Lula administration in 2005, and of having intentionally hidden the facts from investigators. Three weeks later, the full plenary of the Chamber voted on the recommendation of expulsion. In a secret floor vote, the Chamber decided 256 to 209 against expulsion. Cunha remained in Congress for the duration of his term and, even though he was later convicted in Brazil's high court, was re-elected in 2006 and 2010. In 2013, he was sentenced by Brazil's high court to nine years of jail for corruption and racketeering. As this case illustrates, Brazil's Congress offers an interesting test of voting rules in accountability processes. In response to a series of scandals, in 2001 the Chamber created its Ethics Committee to judge deputies accused of acts that broke Chamber rules. The fifteen members of the committee are selected from among the political parties represented in the Chamber according to complex party proportionality rules. Each party has different procedures for nomination, but in general, appointment to the committee is the result of party leaders' preferences and individual member preferences. Members serve for two-year terms, and cannot be substituted during their terms. The Committee is required to investigate whenever the Mesa Diretora, the leadership of the Chamber, receives a request from deputies or citizens for an investigation. During the congressional term investigated here, a total of 51 potential cases were referred to the Committee. The congressional term (2003–2006) immediately following the creation of the Ethics Committee was marked by three major scandals, including the "bingo" scandal, the "post office" scandal, and the mensalão – or big monthly allowance – scandal. They suggested that congressional votes were being corruptly influenced: deputies were receiving money or being allocated government posts to distribute among their supporters in ways intended to influence the direction of their legislative decisions, with pernicious effects in terms of governance. The process for punishing legislators involved in any infringement of ethics codes in the Chamber follows a two-stage process (Figure 1). On the left side of the Figure, the 15-member Committee votes whether to recommend expulsion ("Expel") or not ("∼Expel"), under an absolute majority rule. In cases where it decides to recommend expulsion ("Expel"), the case then moves to the right side of the Figure, and the full 513 members of the Chamber vote, under a simple majority rule. In 17 of the 51 cases (33.3%), the Ethics Committee recommended expulsion. However, the Chamber subsequently approved the committee's report in only 4 (7.8%) cases. Voting in the Ethics Committee until 2013 was open, in contrast to the plenary, where it was secret in expulsion votes. Given the sequential structure of the decision-making process, the floor's final decision may not be free of selection bias: the sample of legislators whose cases are voted on the floor of the Chamber consists only of legislators that the Ethics Committee has recommended for expulsion. These legislators may differ in important unmeasured ways from those legislators that the Ethics Committee decided to acquit. For example, a powerful legislator (who is either a party leader or a Chamber leader) might be tremendously influential within the committee. Given that the Ethics Committee's decision occurs under an open vote procedure, permitting retaliation against committee members, such a deputy might be more likely to survive. This might not be the case at the floor level, where legislators use secret ballots. A number of statistical procedures are designed to avoid selection bias in sequential estimations of conditional probabilities. The most commonly used is the Heckman selection model (Heckman 1974, 1979). Sartori (2003), however, argues that Heckman selection models are appropriate only when at least one extra explanatory factor influences selection, but not the subsequent outcome of interest. Sartori proposes a maximum-likelihood estimator for use with identical explanatory variables, with the assumption that the error term is the same in the two equations. Sartori points to three conditions in which identical explanatory variables can be used in both the selection and outcome models, when both dependent variables are binary: (1) the selection process and the outcomes of interest involve similar decisions and goals; (2) the decisions have the same causes; and (3) the decisions occur within a short time frame or are close to each other geographically. In this paper, there is no variation in the factors that influence the decision to convict between the Ethics Committee (selection) and the Floor (outcome). Only the vote procedure changes, from an open to a closed vote. Sartori's three conditions are met: the outcomes of interest involve similar decisions (expulsion or absolution), similar causes (involvement in corruption scandals), and are temporally and geographically proximate. Therefore, we use Sartori's binary selection model, attributing three values to the dependent variable: 0 if the Ethics Committee decides not to punish; 1 if the Committee decides to punish but the Chamber floor does not; and 2 if both vote to punish. We use distinct variables to test our three central considerations about publicity, power, and procedure (see descriptive statistics in Appendix 1). We measure publicity by the media prominence of the accused legislator and the severity of the alleged crimes. 'Media' measures the coverage a deputy has received in two leading media outlets (the Veja weekly newsmagazine and the Folha de São Paulo, Brazil's largest newspaper). This is a strictly numerical measure, with no judgment about the positive or negative nature of that coverage, although the story-count focuses solely on mentions of the deputy in stories about corruption scandals. We hypothesize that the greater the media exposure, the higher the probability of punishment in committee and on the floor. This expectation is grounded in the empirical literature, which posits a close link between accountability and effective media dissemination of relevant information (e.g., Adsera et al. 2003; Brunetti & Weder 2003; Chang et al. 2010). 'Penalty' is a proxy for the severity of the alleged crimes, calculated by looking at all court cases pending against the deputy in federal and electoral courts, then summing the maximum potential prison sentences under Brazilian law if he were convicted of all alleged crimes. Other things equal, we expect that the higher the total penalties the legislator faces, the greater the probability of votes for expulsion. Those judging the accused will have more public signals of past improprieties, giving them greater confidence about the accused party's guilt. Five variables estimate how powerful legislators are, and as a consequence, the extent to which they could intimidate peers. 'Party leader' indicates whether a deputy is a leader of his or her party. 'Chamber leader' indicates whether a deputy is one of the 11 deputies who preside over the Chamber of Deputies (the "mesa diretora"). Given the significant power wielded by party leaders in the Chamber and the almost absolute control of the voting agenda exercised by the leadership (Figueiredo & Limongi 1999), we assume that membership of either group is associated with lower rates of punishment, since these legislators have credible access to retaliatory instruments and political resources. 'Campaign expenditure' measures spending in the 2002 campaign; the more the legislator spent, the more likely they are to wield significant power. 'Budget appropriation' is the percentage of the deputy's budget amendments that have been funded: because budget allocations in Brazil authorize the government to spend, but do not compel it to spend, one way the executive branch controls its coalition is by selectively fulfilling deputies' amendments. More powerful deputies are more likely to have their amendments funded; we thus expect that higher budget appropriations are associated with lower punishment. Finally, 'votes' is the number of votes obtained by the accused legislator in the 2002 election. The larger the electorate supporting a particular legislator, the greater his expected political capital among his peers. This is especially likely given the coattails effect in Brazilian legislative elections, whereby high vote-gainers are able to carry members of their parties into office. We expect a negative correlation between the number of votes a deputy has received and punishment. The last consideration, voting procedure, is intrinsic to the two-stage model: that is, the Ethics Committee uses an open ballot and the Chamber floor uses a secret ballot. To test the model in a scenario marked by a relatively low number of observations and hence low degrees of freedom, we ran several variations on the model, with distinct independent variables in each case (Table 1). The strategy of using different model specifications aims to capture the impact of several explanatory variables on the probability of punishing corruption, taking into account the sequence of voting procedures between the ethics committee (open vote) and the floor level (secret vote). As recommended for small-N datasets with which there are few degrees of freedom, our initial models are extremely parsimonious, initially including only the Publicity variables: Media (Model 1) and Media and Penalty (Model 2). We progressively add more complexity by including other explanatory variables in order to test further theoretical expectations. As discussed later, Media proved to be the strongest Publicity predictor for legislators' decisions to punish corrupt legislators, both at the committee and floor levels. As such, we decided to test its impact along with the first explanatory variable that measures Power, Party leader (Model 3). As Media and Party leader (at the committee level) were both statistically significant according to our theoretical expectations, Model 4 is run as an extension of the previous one by including a second variable measuring Power, Chamber leader. Occupying leadership positions in either the party or the Chamber hierarchy diminished the likelihood for the accountability of corrupt legislators at the committee level. This led to the fifth model, which includes the two Publicity variables and the other two relevant variables that measure Power (Model 5). Whereas Media and Leadership positions have a significant impact on the probability of punishment, this exercise shows that the severity of prior crimes committed by the accused legislator has no effect on the probability of punishment. Finally, in Models 6 and 7 the other variables that measure Power (campaign expenditure, budget appropriation and votes) are combined with media exposure of the scandal and leadership positions. Although the number of cases is small, the models show a consistent effect of media and leadership positions within the party and the Chamber of Deputies hierarchy. The models demonstrate that voting procedure, deputies' power, and publicity all have an effect, albeit with important variation across the independent variables. The seven models presented pseudo-R2 measures that range from 21.03 to 33.96. The low number of cases is unfortunate, but it is important to reiterate that this is the full universe of cases during this unusually scandal-ridden term. More importantly, although the number of observations never surpasses 51, the results are robust to bootstrapping. Bootstrapping ran 1,000 iterations, of which 79.9% (799) replicated our results. The observed coefficients of the main explanatory variables continued to show the expected sign, with media positive, party leader and congressional leader negative, and penalty positive. In only 201 (20.1%) bootstrap interactions, could one or more parameters not be estimated. We discuss the three sets of variables in turn below. 1. The publicity variables show mixed results. The 'penalty' variable is not statistically significant, which may reflect the difficulties deputies have in evaluating their peers' levels of corruption on the basis of complex, uncertain, and often lengthy judicial procedures. Media exposure as measured by the 'media' variable, however, has a consistently significant effect in the Ethics Committee and – with one exception – on the floor. The effect is slightly larger in the Ethics Committee, where the vote is open to the public. Although the effect of 'media' is small at the margin, in the aggregate it is both substantive and significant. To illustrate the effect of media coverage, we calculate the predicted probability for the independent variable 'media' using the results of 1,000 post-estimation simulations (King et al. 2000), varying media exposure from the median to the 90th percentile. We calculated the mean of these 1,000 iterations under all three possible outcomes (0, 1, 2), then calculated the difference of means and their p-values (Table 2). The chances that the Ethics Committee will vote "no," absolving a legislator, is substantially greater (79.6%) when 'media' is at the median value (285 mentions). However, it drops dramatically to about 11.4% when media exposure increases from the median to the 90th percentile (2,500 mentions). This difference between the means, -68.3%, is statistically significant at .033 (p-value). As media exposure rises, the likelihood that the Ethics Committee will absolve a deputy decreases substantively, in line with our initial hypothesis. Similarly, under the same conditions, the likelihood of the two bodies disagreeing (a '1' outcome) would rise by 36.5% (from a mean of 19.6% to 56.1%). Finally, and in line with our initial hypothesis, the likelihood of agreement between the two bodies (a '2' outcome) would rise from a negligible 0.7% to 32.5%, a difference of 31.8% that is statistically significant. In sum, a move from the median of media exposure to a higher level has a decisive effect in increasing the likelihood of punishment. The coefficient on media in the first stage (selection model) is consistently different from the coefficient on media in the second stage (outcome model). Note: Standard errors are in parentheses; 1000 post-estimation simulations (King et al. 2000). Calculated using the coefficients in Model 4 (Table 1). 2. The power variables also show mixed but important results. The performance of individual legislators – whether measured by 'campaign expenditure,' 'budget appropriations,' or 'votes' – has no statistically significant effect, meaning that these measures of deputies' performance do not matter either to the probability of their being punished in the Ethics Committee or on the floor (with a partial exception for 'campaign expenditure' in Model 6). One of the stronger results is that party or Chamber leadership are associated with a lower likelihood of punishment in the Ethics Committee. A party leader is nearly twice as likely (92.8%) to be absolved in the Ethics Committee than a peer who is not a leader. Furthermore, members of the Chamber leadership are progressively less likely to be punished, depending on their position in the leadership hierarchy. Simply being a member of that hierarchy already implies a 38.8% decline in the probability of Ethics Committee punishment, in comparison with a backbencher. 3. Note, however, that these results are only significant at the Ethics Committee level, where the vote is open to the public, and thus potentially subjects deputies to retaliation by the accused. With regard to voting procedure, then, in comparing the selection model and the outcome model, we see a significant difference between the Ethics Committee and the Chamber. Especially as regards party or Chamber leadership, power shields leaders from punishment at the Ethics Committee level (where voting is open), but has an uncertain effect on the Chamber floor (where voting is secret), given that the coefficients of these variables, though negative, are no longer statistically significant at the floor level. This result may shed new light on the discussion about legislative accountability and vote procedure. On the one hand, voters under open vote procedure might hold legislators highly accountable. On the other hand, open vote procedure creates an extra burden on legislators who punish misdeeds by their accused peers, leaving them without a shield of secrecy against future retaliation. Two considerations are worth discussing with regard to the model. The first has to do with the sequence of voting. What exactly are the implications of this sequence, particularly in the Ethics Committee, where the vote is open to scrutiny? Do members of the Ethics Committee respond more to the likelihood of retribution from peers they vote to punish, or to pressures from the public which is able to scrutinize their vote? There is no way to get to clear answers from this model, but the fact that most of the variables have the expected direction and effect in the Ethics Committee, but are not statistically significant in the Chamber, raises the possibility that there is a conditional effect at work. The second consideration is related. Both leadership variables ('party leader' and 'Chamber leader') have the expected effect in the Ethics Committee, but not on the floor. That is, under an open vote in the Ethics Committee, a leadership position, which increases the power of the accused, leads to reduced probability of punishment. On the Chamber floor, however, these leadership variables produce no statistically significant results. Although these results are tenuous because of their low statistical significance – which is itself a likely result of the small number of cases voted on the floor – they raise doubts about the conventional wisdom that transparent voting is good for accountability, suggesting the possibility that an open vote in Committee may actually make deputies more susceptible to intimidation than they would be under a secret vote on the Chamber floor. Finally, it is clear that the media play an important signaling role. In many ways, this finding confirms past research suggesting that the media plays an important role as an accountability agent in Brazilian politics. As Ferraz and Finan revealed in their innovative study of Brazilian municipal audits (Ferraz & Finan 2008), in municipalities with higher corruption but more independent media, release of the audits decreased the probability of re-election by nearly a third, by signaling malfeasance to the electorate. The media appear to be playing a similar signaling role in this case, with the effects possibly working through two channels: first, by drawing legislator attention to potential wrongdoing; and second, by informing the public of the presence of potential malfeasance and thus adding to the voting deputies' potential costs of tolerating such wrongdoing. The results of the statistical model resolve many empirical issues with regard to the determinants of voting in the Brazilian Congress. Yet – primarily because the population of cases is historically large but numerically small – they leave unanswered many questions about voting procedure. What does the composition of the Chamber mean for accountability? How does power or media influence voting results under different conditions? And most importantly, what sorts of results would be expected under different voting procedures? To address these issues, we move to a simulated computational model. This section uses a simulation to explore the theoretical implications of the empirical findings, taking the basic parameters uncovered by the statistical model as our starting point. We test how well these simple assumptions approximate reality under conditions similar to those uncovered in the regression analysis. Finally, we use the simulation to illustrate how changes to the value of core variables may lead to important shifts in accountability, with results that bolster both sides of the "sunshine" versus "shield" debate. NetLogo 4.1 software to is used to prepare the simulation (Wilensky 1999). 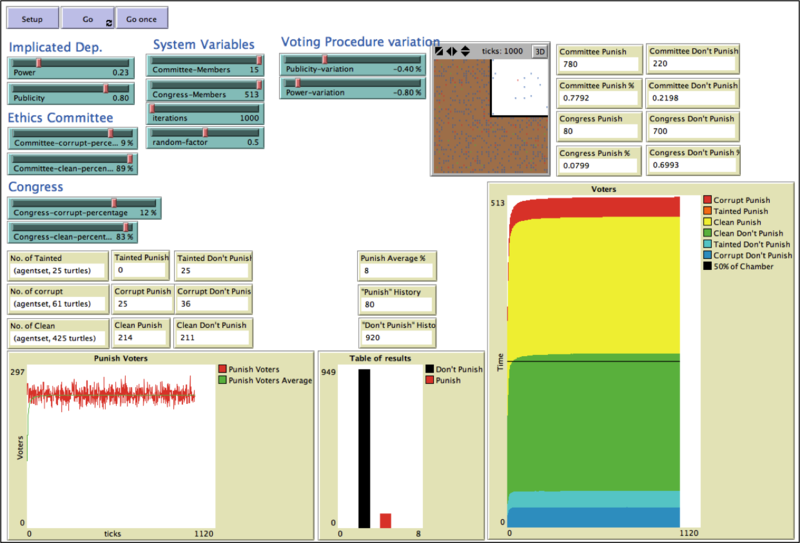 A screenshot of the simulation in Appendix II shows that the model can be altered on five basic dimensions: 1) characteristics of the implicated deputy; 2) composition of the Ethics Committee; 3) composition of the Chamber as a whole; 4) system variables; and 5) voting procedure. The first dimension, characteristics of the implicated deputy, includes a scale of power (0 to 1) and a scale of publicity (0 to 1). The second and third dimensions – Ethics Committee and Chamber characteristics – refer to the share of deputies in each body that are corrupt, clean or tainted. These three different types of legislators have distinct preferences about punishing their peers. 'System variables' includes the number of members of both the Ethics Committee and the Chamber; the number of iterations of the model; and a 'random factor', to capture the unpredictability and uniqueness of each agent's behavior. 'Voting procedure,' measures voting procedure as it is transmitted though the 'power' and 'publicity' variables. Voting procedure can have an effect ranging from -1 to 1 on the value of the 'power' and 'publicity' variables. In running the model, we follow the conclusions of the regression analysis, and assume that both power and publicity matter more under an open vote than under a closed vote. Under an open vote, 'publicity' is expected to have a positive effect, while 'power' is expected to have a negative effect on the likelihood of expulsion, other things equal. We first set all of these variables to the mean indicated in the regression analysis; second, adjusted the model until it was closely approximating the Brazilian data when run under equivalent conditions; and third, began to alter these five key variables to observe the simulated results. At the core of the simulation is the notion (common to agent-based models) that each agent's behavior is governed by parameters that each agent obeys at every iteration of the simulation. In this simulation, legislators have a very simple choice between voting "yes" if they want to punish and "no" if they do not. The sum of "yes's" and "no's" will determine the collective decision of the Ethics Committee and subsequently of the Chamber. But how does each legislator decide to vote yes or no? The two fundamental variables at stake are 'publicity' and 'power,' so that if the difference between them yields a value greater than a 'threshold' value, the legislator votes "yes"; otherwise, he votes "no". Each type of deputy will have different preferences about: i) dealing with the accused legislator on congressional business in the future, ii) being personally tainted in the public eye by the vote on whether to expel, iii) whether the Congress' institutional reputation would be tainted, and iv) the likelihood of potential retaliation. Added together, these preferences mean that other things equal, clean legislators are more likely to convict, corrupt deputies much less so, and tainted somewhere in between. Yet clean legislators will not always vote to expel, nor will corrupt deputies always vote to acquit. These decisions depend on the joint effects of the levels of 'publicity' and 'power,' mediated by voting procedure. 'Publicity' and 'power' are variables related to the accused legislator, so all the voting legislators have the same values when they vote, but they are modified by the random-factor unique to each agent, so that no agent has the same perception of 'publicity' or 'power.' This randomness serves as a means of modeling each person's freedom of choice and potential unpredictability, without negating the central characteristic of each deputy type (i.e., 'clean,' 'corrupt,' or 'tainted'). IF ((X + (rX)) − (Y + (rY) > Z; THEN vote "yes"; ELSE vote "no"
There are of course many functions of Z [x,y] that could be studied in the future. In the analysis below, however, we use this function, which despite its relative simplicity, closely approximates the results of the statistical model. Using the parameters uncovered by the statistical regression model, and through a series of iterative efforts, we generated the simulated model that would best replicate the predicted probabilities of the statistical model at various levels of media exposure. We first set the composition and number of the Ethics Committee and the Chamber to their actual mean values in the Brazilian Congress during the 2003–2006 legislative session, as measured by the 'penalty' variable in our dataset. Second, we set the value of 'power' (0.23) as the average of means of the two statistically significant 'power' variables in our dataset: 'party leader' (0.156) and 'Chamber leader' (0.314). Using the results of the statistical model as our benchmark, we determined the random factor, and the variation exhibited in the statistical model between the first open voting procedure of the Committee and the secret vote in the Chamber. This variation is normalized in the simulation, and set at the values of -.4 and -.8, respectively, for 'publicity' and 'power.' In other words, a secret vote in the plenary reduces the effects of 'publicity' and 'power' by that factor. To simulate an open vote in the plenary, the factor is set to zero. The random factor is more important than initially imagined, especially during the Ethics Committee deliberations. The random factor helps to explain why it is that even when 'media' is at the 90th percentile, there is still an 11% chance that the Ethics Committee will vote "no", even under an open vote. It should be noted, though, that because the simulation is focused on the voting behaviors of individual members of Congress, while the random factor is very important in the Commission with only 15 members, it is relatively insignificant in the Congress with 513 members, where the higher number of legislators reduces the chances that a few "unpredictable" legislators can change the voting result. Figure 2 holds all parameters steady while altering the value of the 'publicity' variable, demonstrating that the final simulated model, used in the remainder of this paper, very closely mirrors the results of the statistical model. Fitting a set of parameters for an agent-based model to match a statistical model is relatively rare in the computational social science literature but, as discussed below, has a number of potential benefits. Figure 2. Comparison of predicted probabilities, simulation versus statistical model. Note: Calculations by authors. Parameters of model: Power: 0.23; Ethics Committee Composition: 9% corrupt, 89% clean; Chamber Composition: 12% corrupt, 83% clean; Random factor: 0.5; Publicity variation: -40%; Power variation: -80%; Members of Ethics Committee: 15; Members of Chamber: 513; Iterations of model run for each predicted value: 1,000. It is of course unreasonable to claim that the simulation is anything more than an aggregation of the relatively simple rules followed by hundreds of actors in an artificial world. For that reason, the conclusions of this section are merely theoretical, aimed more at suggesting how the variables may interact – in sometimes surprising ways – than at making specific claims regarding the Brazilian case. However, the simulation can contribute to our understanding of accountability processes in at least three ways. First, by explicitly laying out our assumptions of how voting procedure may matter. Second, and following Miller and Page (2007, 58) in their exhortation to use computational modeling as a productive theoretical exercise, by providing theoretical guidance to research that might be productively conducted if more real-world empirical data were available. Finally, by expanding the number of "cases" beyond the very limited set available in the real world (n=51) to a virtually unlimited number of potential cases, permitting us to demonstrate that small changes in basic parameters have important and highly contingent effects on accountability. Accountability is in many ways an "emergent" property, deriving from individual behaviors that combine in "messy, contingent" ways (Miller & Page 2007, 44; de Marchi & Page 2014, 6). Below we test the effects of shifting three of the most interesting parameters: voting body composition, publicity, and voting effects. With regard to 'composition,' the model is constructed such that any change in the makeup of the Ethics Committee or the Plenary is expected to have an effect on the likelihood that the Chamber will vote to expel. It is thus no surprise that changing 'composition' has an effect on the probability of expulsion. 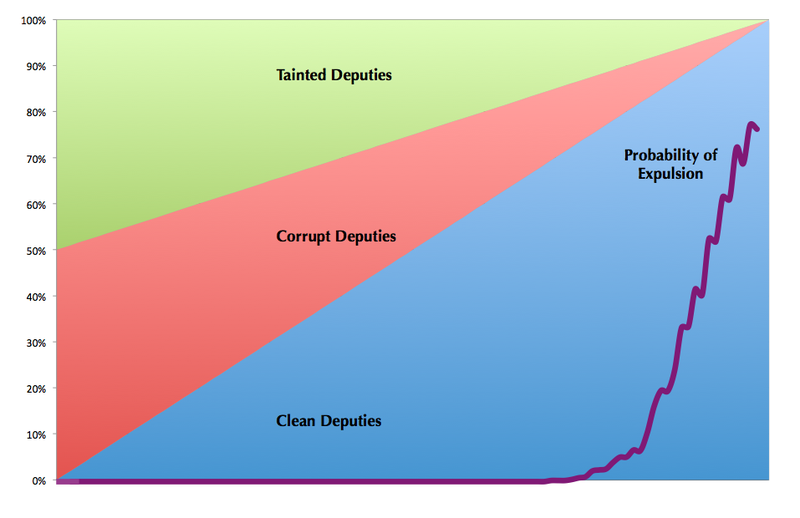 What is interesting, however, is that the model shows that there is a tipping point in terms of the proportion of clean deputies beyond which the likelihood of punishment grows rapidly; but that even with relatively high levels of publicity, expulsion is far from guaranteed, even when Congress is entirely composed of 'clean' deputies. Figure 3 illustrates this, dividing deputies by clean, corrupt, or tainted. Drawing a vertical line upward from any point on the x-axis will provide some distribution of clean, corrupt and tainted deputies. The graph begins on the left side with a Chamber evenly split between corrupt and tainted deputies, with the number of clean gradually rising from 0% on the far left to 100% on the far right. Superimposed on the graph is a heavy line indicating the likelihood that the Chamber will vote to expel, as calculated by the model when we maintain all variables except composition constant (and assume 90% 'publicity'). Figure 3. Composition of the Chamber and Probability of Expulsion. Parameters: Publicity = 0.9; Power = 0.23; the Ethics Committee is 89% clean, 9% corrupt, and 2% tainted; Random =0.5; Publicity variation = -0.4; and Power variation = -0.8. Results are from 1,000 iterations of the model run at each percentage point. As the Chamber's composition rises from 74% Clean to 93% Clean, the likelihood of a vote for expulsion on the floor of the Chamber rises rapidly, from 1% to over 53% (reaching 77% when the Chamber is composed solely of clean deputies). In other words, even though the decision to punish is individual, the likelihood of punishment varies non-linearly as a result of slight changes in the composition of the Congress. This suggests an important policy implication of our research: namely, that legislation banning certain types of candidates from office – such as candidates who are under investigation or have been convicted in a trial court – may have an important effect on increasing the likelihood of accountability (coincidentally, such legislation was approved in Brazil in 2010). A second implication comes from the non-linear nature of the results. Brazil's Chamber of Deputies is – as measured by the empirically-measured 'penalty' variable – currently made up of a proportion of 83% clean, 12% corrupt, and 5% tainted deputies. This figure is of course tenuous, since the total penalty measure on which it is based was shown to be an uncertain predictor. Nonetheless, it suggests that Brazil may be at a crucial point in the accountability function. If roughly 5% of corrupt deputies were replaced by clean peers, that might move Brazil to a much more stable pro-accountability equilibrium. However, a shift in the proportion of corrupt politicians by as little as 10% could move Brazil to an equally stable zero-accountability equilibrium. In other words, Brazil could be on the cusp of great improvements, or could fall back to a less favorable position. Another finding of the simulation regards the effects of 'publicity.' It is both obvious and tautological to argue that the 'publicity' variable matters; after all, we assumed from the outset that publicity matters, and it is thus built into our model. However, it is worth noting that because the simulation sums decisions by 513 distinct agents, the effects of the 'publicity' variable are non-linear, and begin to have an important accountability effect only once the threshold value has been crossed. Under equivalent conditions, even relatively small changes in the publicity of the charges against a deputy can have important effects on the likelihood of punishment. From a policy perspective, this suggests that media and prosecutors have an important role to play in changing the likelihood of punishment, whether it is by writing about scandal (our 'media' variable in Section 2) or by charging those suspected of crimes (the 'penalty' variable). Finally, this paper has assumed that a change in voting procedures influences legislators through the 'publicity' and 'power' variables in at least two ways: 1) by making clear to voters who has voted in what manner, and thus influencing the costs to the legislator of voting for or against punishment (the sunshine effect); and 2) by altering the likelihood of retribution against the legislator if he votes to expel his peer (the shield effect). To evaluate the tradeoffs between these two effects, we compare the results under four distinct sets of parameters, shown in Figure 4. Model A is a benchmark model that replicates the parameters used in Figures 2 and 3, and follows the rules of the Brazilian Congress, with an open vote in the Ethics Committee and a secret vote in the Chamber. 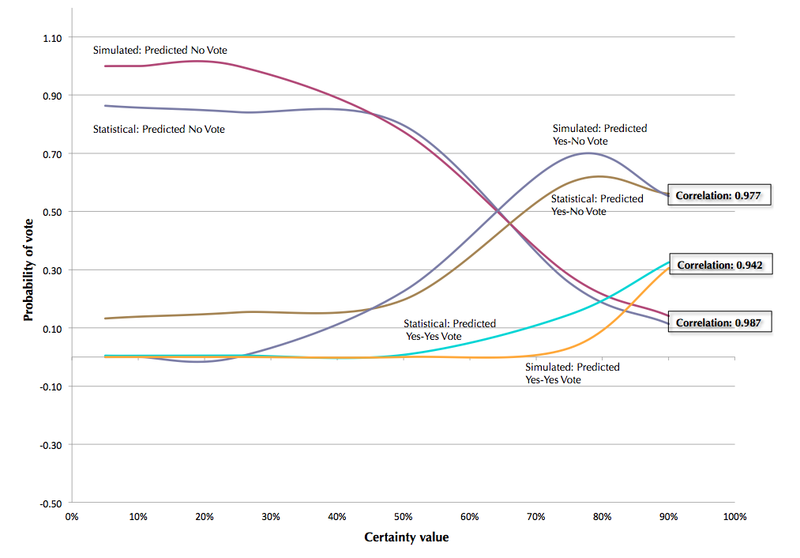 Let us compare Model A's results with those of Model B, which uses the same parameters but assumes that instead of using a secret vote, the Plenary switches over to an open voting system. The results are unequivocal, illustrating that at all levels of the 'publicity' variable, an open vote in the Chamber leads to a greater likelihood of expulsion. But this does not necessarily mean that a shift to an open voting procedure would always lead to greater accountability. Models A and B test the effect of voting rules when the accused legislator is of relatively low power. What happens if we raise the power of the accused legislator significantly (from 23% to 83%)? 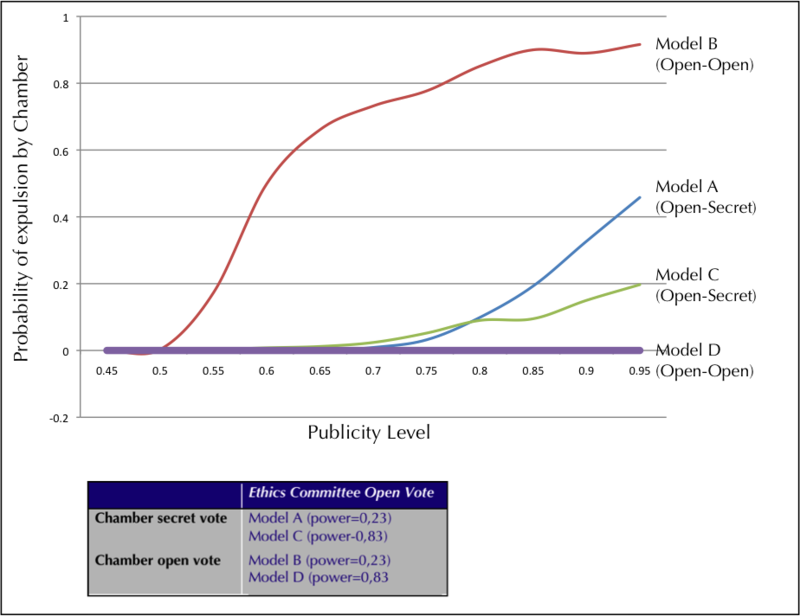 A comparison of the results of Model C with Model A shows that under the original voting conditions (open in Ethics Committee; secret in Chamber), a more powerful legislator is less likely to be expelled. Things get interesting in the comparison with Model D, which looks at how the Chamber would judge this powerful legislator under an open voting system. The previous relationship is reversed: rather than open voting leading to more punishment, it instead leads to less. The difference in punishment, best illustrated by the huge gap between the results of Models B and D, is sufficient to illustrate that perhaps secret voting is not a panacea under all conditions. The two simultaneous but contradictory effects at work here – sunshine and retaliation – may help to explain why the statistical model in Section 2 produced ambiguous and insignificant results on the Chamber floor. The policy implications of these results are complex, to say the least. They suggest that it is not correct to assume that open voting is always the best solution. It may be enormously effective if the accused legislator is relatively weak, but extraordinarily ineffective if he is relatively strong. Similarly, secret voting is less likely to result in expulsion when the legislator is weak, but more likely to lead to expulsion, other things equal, if he is strong. A second source of complexity is the two-stage voting model used in Brazil. We do not attempt to vary the voting procedure of the Ethics Committee here, but one implication of these findings is that the Ethics Committee may also be intimidated by powerful legislators inhibiting its members from recommending expulsion. Perhaps one policy solution would be for the Brazilian Congress to use two sets of rules that take the power differential between legislators into account: secret voting whenever a party leader or Chamber leader is being judged, but open voting otherwise. This paper has used a combination of approaches – a statistical model of an actual legislature, and a simulated model of an artificial legislature – to consider the effects of voting rules on accountability. Our findings illustrate that because the effects of secrecy and sunshine on individual legislators' voting decisions are always concomitant, the effects of voting rules are highly contingent, making it difficult to definitively answer the question of whether secret voting procedures indeed enhance accountability-holding. In sum, the effect of voting procedure varies significantly depending on the contextual conditions under which it is used. The simulation also casts doubt on sunshine approaches to accountability that assume transparency is always the best remedy. While we are cautious in drawing conclusions from the simulation, it does show that under certain simulated conditions, open voting may be less effective than secret voting in driving accountability. If nothing else, this suggests that further research about the effects of open voting is warranted, and that it might be worth contemplating different rules depending on who is being tried, such as secret voting during the legislative trials of congressional leaders, and open voting for backbenchers. Under simulated conditions, two truisms in the study of accountability processes hold true: that it is important to remove corrupt players from the game, and that the media matters. The simulation illustrated that the accountability gains from changing the corruption composition of the voting body can be rapid and non-linear. Meanwhile, the statistical model illustrates that the media matters significantly, even behind closed doors, when secret voting is in use. Finally, beyond the important implications for accountability processes, this paper offers an equally intriguing lesson regarding institutional rules. It suggests that institutional rules may be highly contingent, and their effects less straightforward than commonly assumed in the institutionalist literature. Contrary to our common assumption that the effects of institutional rules are constant and consistent across time, we find that even when applied even-handedly, small changes in the characteristics of the actors applying the rules may lead to very different outcomes. (*) Although there are only 513 deputies in the Chamber of Deputies at any given moment, a large number of deputies leave office to take up posts in state or federal government, and of course, some become sick or die in the course of their terms. In these cases, their position is filled by a so-called suplente. This explains the fact that we have 628 observations, rather than only 513. Note: Full code of the model is available at https://www.openabm.org/model/4246/version/1/view, as well as on the NetLogo webpage at http://ccl.northwestern.edu/netlogo/models/community/Sunshine%20or%20Shield%20Model. <!-Notes here --> 1Although there have been some female politicians in Brazil accused of wrongdoing, men are more prevalent in both politics and in wrongdoing. We therefore use masculine pronouns. 2In 7 cases, the accused deputy resigned before the Ethics Committee's decision. In another 4 cases, either the Supreme Federal Tribunal or the Electoral Court acted before the Ethics Committee. 3The Internal Rules of the Chamber of Deputies allow the Ethics Committee to impose three types of penalties for legislators accused of violations of parliamentary decorum or administrative improbity: verbal or written censure, which can be effected by the committee itself; temporary suspension of legislative activities for 30 days; or permanent loss of legislative mandate (known as cassação, or expulsion). These last two penalties – suspension and expulsion – can only be enforced if they are approved by a plenary vote on the floor of the Chamber. All of the cases reviewed here were cassação cases. In 2013, under great pressure from voters, public opinion, and transparency NGOs, Congress adopted an open vote procedure in the plenary, as well as the Ethics Committee. 4There is also a possibility that deputies facing expulsion may choose to resign, rather than face expulsion. Cases of deputies who resign before a vote do not enter into our sample. This exclusion fits our central concern of understanding not what happens to all accused deputies, but rather, how voting rules influence the destiny of those whose cases come before the Ethics Committee and plenary. We thank Scott Desposato for raising this issue. 5We do not include any past convictions, because until 2010, the slow pace of the court system and the protections offered to high-ranking politicians meant that no sitting deputies had received a final, unappealable conviction in Brazil's high court (Taylor 2011). 6Chamber leader is coded as follows: 0=no position; 1=4th secretary; 2=3rd secretary; 3=2nd secretary; 4=1st secretary; 5=2nd Vice President; 6=1st Vice President; 7=President. 7On bootstrapping, see Keele (2007, Chapter 8). 8One may also argue that the reasoning about the lack of statistical significance of the leadership variables at the floor's level is due to the low variance in floor votes, given that most legislators accused are absolved. Thus, it may not be surprising that leadership lacks any strong effect on the Chamber floor. However, as we will demonstrate in the computer simulation, this result has to do with the effect of voting procedure and potential retaliation effects. 9Fitting the set of parameters in the agent-based model to match the results of the statistical model is not a frequent practice in computational modeling of social phenomenon, but we hope this paper will demonstrate its utility. Leaders in the field have argued for similar combinations of methods: De Marchi (2005) argues that we should build from statistics to construct more robust, realistic models; de Marchi and Page (2014, 4) argue that "political science would improve" if modelers were to combine agent-based modeling and traditional deductive techniques; and that ABMs can include heterogeneity on a variety of dimensions that "can be matched to actual distributions for parameters of interest" (6). One past example of parameter-setting based on empirical data is Laver and Sergenti's (2012) calibration of parameters using expert surveys of the policy movement of political parties. 10The model allows the authors to set the proportions of "Corrupt" and "Clean" legislators; the proportion of "Tainted" is calculated as the remainder, not shown in the screenshot. 11These preferences are expressed in the simulation as follows. If Clean: [(X+r*X)-(Y+r*Y)]>Z; "Yes". If Corrupt: [(X+r*X)-(Y+r*Y)]>(Z*2); "Yes"; If Tainted: [((X+r*X)/2)-(Y+r*Y)]>Z; "Yes", where X=Publicity; Y=Power; r=random factor; and Z is the threshold for a vote to expel, determined as Z=((X-Y)/2)+0.15. 12We calculate "corrupt," "clean," and "tainted" legislators on the basis of the maximum number of years of jail time they would serve if convicted of all charges against them. "Clean" legislators face no jail time; "tainted" face anything above zero and less than 3 years; and "corrupt" face anything above 3 years. The proportions of each type of legislator are based on the values of the "penalty" variables for all members serving during the 2003–2006 session of the Brazilian Chamber. 13We do not analyse the possibility of secret voting procedures in the Ethics Committee because of a circularity problem: the simulation is based on parameters that mirror the Brazilian case. We have included the variables "Publicity" and "Power", which attempt to compensate for the differences observed between the Ethics Committee and the Chamber. To simulate an open vote, those two variables are set to zero. But we do not know what the corresponding variables would be if the Chamber had open voting and the Ethics Committee used closed voting. ELSTER, J. (2010). Publicity and Secrecy in Jury Proceedings. Unpublished paper presented at the Seminar "Scrutin secret et vote public, huis clos et débat ouvert." Paris: College de France, June 3–4. FIGUEIREDO, A. & Limongi, F. (1999). Executivo e Legislativo Na Nova Ordem Constitucional. Rio de Janeiro: Editora FGV. LAVER, M. & Sergenti, E. (2012). Party Competition: An Agent-Based Model. Princeton: Princeton University Press. MILLER, J. H. & Page, S.E. (2007). Complex Adaptive Systems: An Introduction to Computational Models of Social Life. Princeton: Princeton University Press. NAURIN, D. (2004). Dressed for Politics: Why Increasing Transparency in the European Union Will Not Make Lobbyists Behave Any Better Than They Already Do. Unpublished Ph.D. Dissertation, Department of Political Science, Göteborg University, Sweden. TAYLOR, M. (2011). The Federal Judiciary and Electoral Courts. In Corruption and Democracy in Brazil: The Struggle for Accountability. Ed. Power, T. & Taylor, M. South Bend: University of Notre Dame Press.